Autocuehire can help make your Awards Ceremony perfect. Autocue teleprompter hire service for Awards Ceremonies. We are a specialist autocue, teleprompting hire company, providing tailored prompting solutions using state-of-the-art teleprompting equipment and software. All of our professional operators have extensive experience working on all kinds of Awards Ceremonies. Every Awards ceremony is different and we understand how important it is to recognize the people in your industry and honour their achievements. We will discuss exactly what you need to help make the presentation word perfect. You tell us where and when your event is taking place, provide us with your script, and we will take care of everything else. We deliver all of the equipment to your location. Our operator sets everything up, inputs your script and runs the autocue for your rehearsals and show. Our operator is happy to make as many script changes as you need throughout the rehearsal, so that it is perfect for your live ceremony. After the show has finished, our operator packs up the kit and takes it off site. The traditional prompting set up for Awards Ceremonies uses our Executive Prompting system, sometimes called ‘Presidential Prompters’ or ‘Conference glasses’. 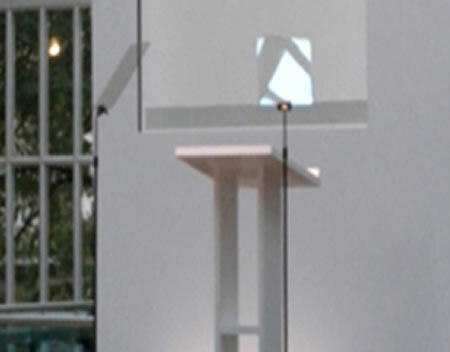 The set up uses two glass stands and teleprompter monitors, positioned in front of a lectern. The script is reflected on to the prompting glass from the monitor below and can be seen by the presenter but not the audience. The presenter reads from the two teleprompter glasses, giving the impression that they are looking around the audience. The conference glasses can also be used singularly if preferred. The height of the glass stands and the angle of the prompting glass are fully adjustable to match the eye-line of the presenter. As an option, we also offer a motorized version of the stands that can be remotely raised and lowered by our operator during the show. These are perfect if you have more than one presenter of greatly differing heights. We can also provide straight reading monitors, or we can display the autocue words on in-house monitors. Whatever your requirement, we are very happy to help.